The Green Mini Demo Derby in Custer, WI brings the worlds of county fairs and alternative energy into collision. 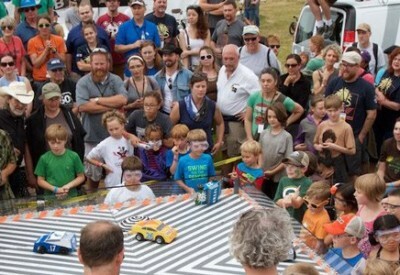 Solar-powered remote control cars compete in heats and finish with a championship showdown. You won’t want to miss this all-ages tournament! Milwaukee-based artist Colin Matthes makes each Green Mini Demo Derby car by hand and organizes the event. Colin is a member of JustSeeds Artist Cooperative. Do you have the skills to take down Sunrun, 2018’s defending champ? To sponsor your own Green Mini Demo Derby car, contact Jordan Pupols at jordanp@midwestrenew.org.